Welcome to our Game In Progress coverage of The Legend Of Zelda: Breath Of The Wild. Over the next few weeks, Gameological Editor Matt Gerardi will be playing through the Switch version of Nintendo’s latest fantasy epic and checking in with reports along the way. This debut installment covers the game’s first five hours and is as spoiler-free as it could possibly be. 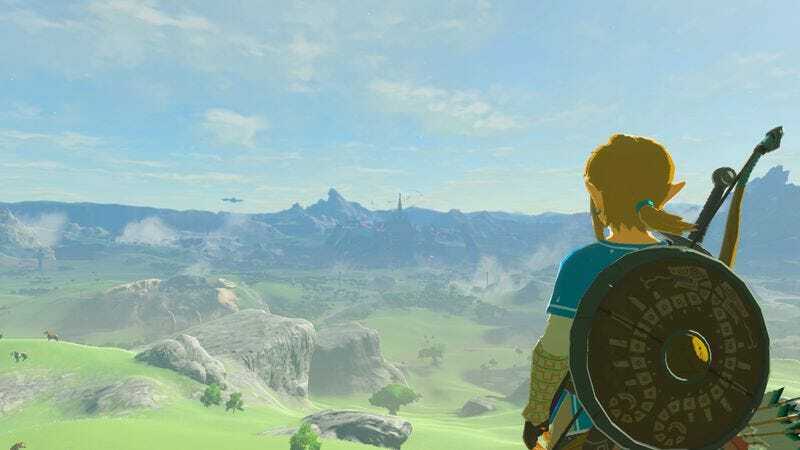 We invite you to read, comment, and (when the game is actually out) play along as we march our way toward Calamity Ganon, whatever the hell that means. The first hours of Breath Of The Wild feel like a direct rebuke of one of the biggest issues plaguing many of the latest Zelda games: their interminable, brain-dead openings. Like Skyward Sword or Twilight Princess, Nintendo’s latest fantasy adventure spends its early goings teaching players how it works and what they’re in for, but while those past introductions held your hand and dragged you along at a snail’s pace, Breath Of The Wild offers only the most perfunctory of guidance. A mysterious old man provides some basic tutorial information and your objectives, while a disembodied voice helpfully marks your first destination on a map. Other than that, it’s just Link and Hyrule, a land that hasn’t felt this alive and dangerous in more than 30 years. After awakening in some sort of magical stasis chamber and being gifted a fantasy iPad, our elven hero is sent off into a section of wide-open Hyrule land known as the Great Plateau. As soon as you leave your cave, you’re greeted with the first of Breath Of The Wild’s gorgeous vistas. A few notes from a solo piano—your most constant companion on this journey—fade, and Link is left standing alone among the sounds of undisturbed nature. This is Breath Of The Wild’s primary state: a powerful serenity in a colorful world where the landscapes blur into living impressionist paintings. But there’s a fine line between serenity and desolation, and Breath Of The Wild walks it impressively. What little evidence of civilization you’ll find in the Great Plateau is steeped in tangible history, like ruined temples that have been destroyed by some sort of malicious robotic force, the broken-down remnants of which still cling to what’s left. Breath Of The Wild is aware of its own history, as well. This is postapocalyptic Zelda, and the game’s majestic emptiness is built from the husk of a setting players have come to know intimately. In Breath’s era, what was once ornate and sanctified is now crumbling. This deconstruction of the familiar even bleeds into the game’s soundtrack, where it’s perhaps most affecting. If you’ve played past games, you might enter a place you know and hear its theme—one that’s guaranteed to be etched on your brain—and just like that physical space, the music has been torn down, its grand motifs rewritten for a lonely, downtrodden piano. As distant and uncaring as the game is, this opening section is undoubtedly a tutorial. The Plateau sits high above the rest of Hyrule, and Link is trapped there until he can find four shrines, each of which bestow a new ability (infinite-use powers that act as replacements for the items you’d find in past games, like remote bombs and a magnet that lifts metal objects) and, should you solve the puzzles inside them, a special orb. The four powers you find in those shrines form the foundation of how you’ll interact with the world around you, and the tests you’ll have to go through are clever, organic ways to teach you the basics of using them. The Plateau itself also exudes that same dedication to education through play. It’s a diverse stretch of land—ruins, snowy mountains, dense forests, windy valleys—that gives players an opportunity to experience the many kinds of danger Hyrule has in store and lets them experiment with the many ways to deal with it. Given everything you’re up against, it’s easy to feel overwhelmed and underpowered. You can’t just cut down grass and find hearts to restore your health, which can melt away in a few seconds if you stumble in the game’s more complicated combat. You have to be on the lookout for food and campsites where you can cook supplies to make them more effective. You don’t have a map full of icons telling you where things are. You have to climb up high, find them for yourself, and make your way there, maybe stopping along the way to mark an unreachable treasure chest on your map so you remember to come back later. Your weapons will break after what feels like just a couple of smacks, and you’ll have to pilfer what crappy equipment you can find. Huge, seemingly impenetrable foes might pop up, and all you can do is run for your life, telling yourself you’ll be back after you have something that’ll do the trick. You can quickly freeze to death up in the mountains if you don’t learn to prep properly, and without understanding the limits of Link’s stamina bar, you might find yourself losing your grip halfway up a cliffside and falling to your doom. Appropriately, for a game where the only thing you have at the start is a pair of boxers and a voice in your head, it takes a while to find your footing. Hyrule doesn’t hold back, and the struggle can be frustrating. But that Breath Of The Wild dares to let you struggle is what makes those first hours so thrilling. Danger is good. Danger is what gives video games life. Breath Of The Wild has finally reconnected with something the series knew so well back when it debuted: Being in over your head is fun, and finding your own way forward will always be more rewarding than getting led there. Purchase The Legend Of Zelda: Breath Of The Wild here, which helps support The A.V. Club.